Search engines have been minimizing the importance of keyword relevance signals for ranking for many years. It’s a fact that keywords are no longer necessary or mandatory to be present in the title tag or in heading tags (H1, H2, H3) in order to rank in the top five of the search engine results pages. Even using the exact keyword phrases within the text of a webpage is no longer required. 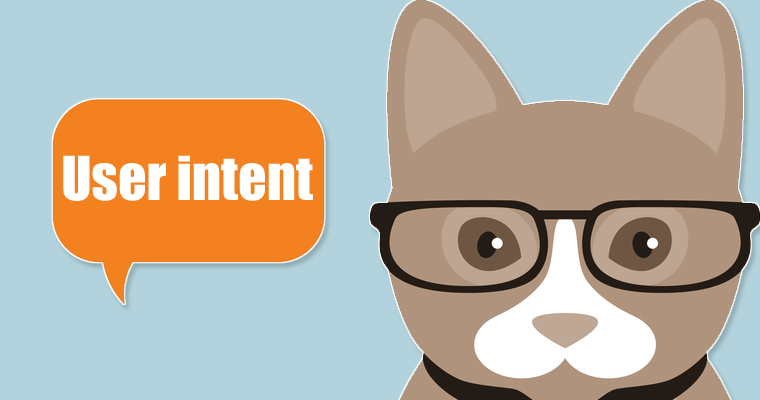 Should you abandon keyword research and focus more effort on content creation? Keyword research is still important, but in a different way than has been practiced in the past. For example, the different meanings of a phrase and the popularity of each meaning is vitally important. 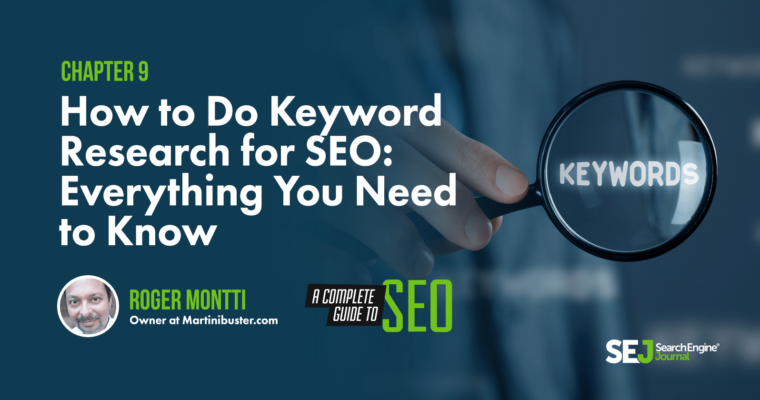 The skillful use of words continues to be important, and this guide will show you how to research keywords in a manner that is appropriate for the way search engines work today. Show how keyword research continues to be useful. Shine a light on numerous misconceptions. Show you how a scientific understanding of how keywords are used by search engines today can help you rank for high traffic/high conversion keywords. 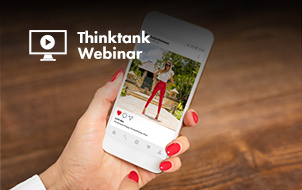 The principles outlined in this guide apply equally to mobile content and is appropriate regardless of how textual content is delivered to the consumer. 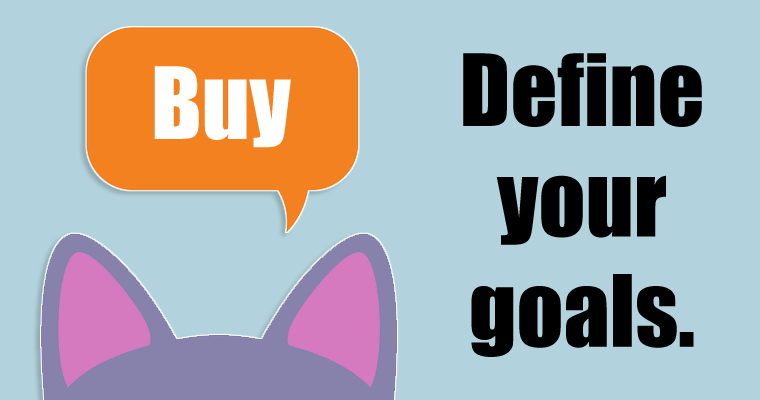 Define Your Goals: What Do You Want to Accomplish with Search Traffic? The biggest mistake you can make is to define success as more traffic. But more traffic should never be your goal. Increasing sales should always be the goal. Traffic is simply a means to solving the sales problem. Traffic is never the end goal. Increasing earnings should always be the focus. When developing a keyword strategy for an ecommerce website, the first step is to define the sales problem the business wishes to solve. These are your real goals. Feeding different segments of the sales funnel. Ad clicks and ad impressions. Building awareness of your site, services, and products. Once you define the keyword goals you can then develop keyword categories to address those goals, and begin categorizing your keywords in order to build a content and marketing strategy. The first two categories are directly sales related; they solve a business problem directly. The second two categories (Feeding research levels of the sales funnel/building CPM traffic) can be seen as consumer-related because they generally revolve around solving a problem for consumers. Money phrases are keyword phrases that are associated with a high level of sales (e.g., “cheap widgets” and “where to buy widgets”). Money phrases are important (and competitive!) because they almost always result in a sale. Money phrases are also important to ad-supported sites because the site visitor, being predisposed to making a purchase, is also more likely to click an ad unit and earn revenue for the web publisher. Advertising associated with money phrases usually have a higher cost per click, resulting in higher advertising earnings. That’s why these keywords are called money phrases! Money phrases are highly competitive and difficult to rank for. That’s a given. A more important consideration that many are unaware of, is that pay-per-click (PPC) ads will siphon off traffic that is (arguably) more inclined to make a purchase, with the rest of the traffic distributed to the organic results. A sizable portion of the money keyword traffic is skimmed off through the PPC ads. I’m going to show you how to solve this problem. Stay with me because the solution I am going to share is not entirely well understood in the search marketing industry. Aside from the obvious phrases containing words like “buy” in them, there are an additional set of keyword phrases that indicate a user intent to make an immediate purchase. These are so-called long-tail “money phrases” that are important to rank for. I have categorized long-tail money phrases into five categories. Each category represents a multiplicity of keyword phrases and their variants (singular and product name variants). I have developed many spreadsheets of valuable keyword phrases in a variety of industries. While I can’t publicly share them, I have shared the five categories I use so you can develop and categorize your own list of money phrases. Now here’s the important thing to understand: There are good reasons to not use the list to build a site architecture that revolves around the money phrases. Why? Because that is the way to build a site tuned for keyword relevance. This is an important point that I will return to later. But for now, understand that many sites that the search engines are ranking today are not built with a site architecture that revolves exclusively around money phrases. Money phrases are so-called because visitors using those phrases tend to convert and put money in the till. These are the most important keyword phrases for making immediate sales on a regular basis. If your company isn’t ranking for money phrases, then someone else is. So it might as well be you that ranks for the money phrases, right? There is another keyword path to building online sales. Often the barrier to entry for a competitive money phrase is too high. 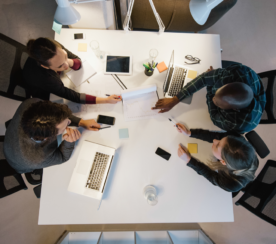 The established companies in the search results have a seemingly insurmountable lead in terms of backlinks, content, social media reach, and other factors that can’t be easily copied (at least not without years of work). 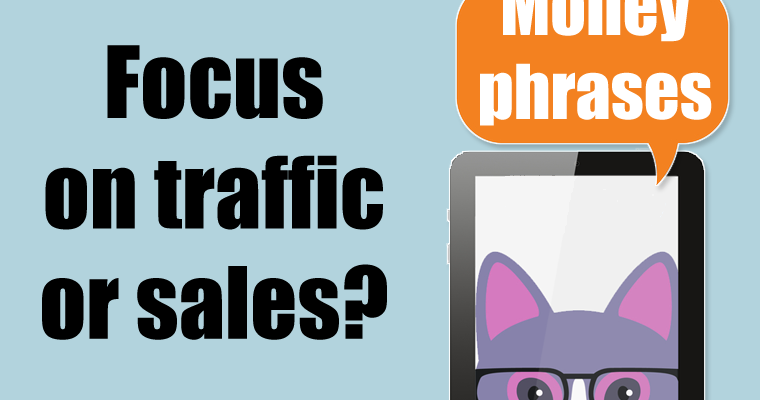 There is another way to build traffic – and that’s with non-money phrases. It may sound counter-intuitive that the way to attract buyers is with keywords that do not convert. But it’s a viable path toward eventually ranking for the money phrases. Most money phrases are awarded to the most authoritative sites. Yes, quantity and quality backlinks play a role. However, content is a highly important ingredient. But not just any content. A site that is comprehensive is authoritative. Authoritative sites are the kind that search engines prefer to rank. Stimulating word of mouth referrals, links, and ultimately money-phrase ranking and sales. This is one of the secrets to ranking for money phrases. Instead of focusing exclusively on the money phrases focus on the authority building long-tail phrases. The old way of ranking for money phrases was with a full-frontal attack on those phrases. Over the years it’s become increasingly evident that comprehensive sites tend to rank for the best phrases. Focusing exclusively on keyword relevance has been showing diminishing returns for the past 10 years. Focusing on the depth of content, expertise, and authority is a solid path to ranking for money phrases. In general, if you want to rank well for the high traffic, two-word phrases then you must be authoritative for the three-, four-, and five-word phrases. In general, a site that is authoritative for a high traffic money phrase is only authoritative because they are comprehensive on a granular level. Once the granular content is in place, the links attracted to the granular topics builds topical relevance for the entire site. 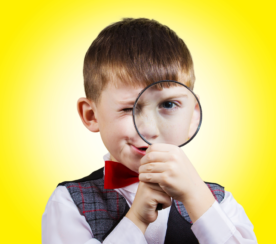 Should You Worry About Latent Semantic Indexing or LSI Keywords? Latent Semantic Indexing (LSI) is a very old technology, developed nearly 20 years ago. Its purpose was to strengthen a search engine’s ability to identify the correct context of a word. Words often have more than one meaning (this is called Polysemy). Thus, a word or phrase appearing on a page did not guarantee that the page was relevant to a search phrase. 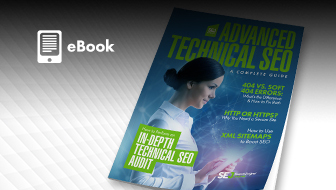 LSI technology was used to overcome polysemy, to help a text-based search engine identify the context of a webpage and thus better match a search query. In 2003 Google acquired an important contextual analysis technology, known as Circa, when Google purchased a company called Applied Semantics. In a nutshell, Circa was based on an understanding of language through the use of the Open Directory Project categories to create themes that a webpage could be classified under. Thus, a webpage could be understood as belonging to a particular thematic topic. 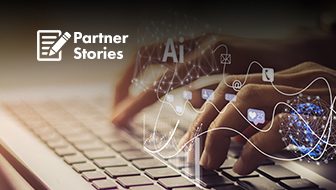 Applied Semantics created the technology that powered Google’s AdSense program, enabling Google to better match website content to keywords associated with advertising. This a kind of contextual analysis that was used as a foundation for the AdSense program, which has since added additional technologies such as placement targeting, interest-based targeting and language targeting to improve and expand the AdSense program. In fact, according to Google, their contextual targeting uses the overall link structure of the entire web to determine what a webpage is about, which is far more sophisticated and advanced than simple LSI. Seeing how LSI has a diminished role in the AdSense program, LSI likely plays an insignificant role in search ranking as well. It is reasonable to surmise that LSI plays a small to insignificant role in search ranking because the science of information retrieval has come a long way since 2003. 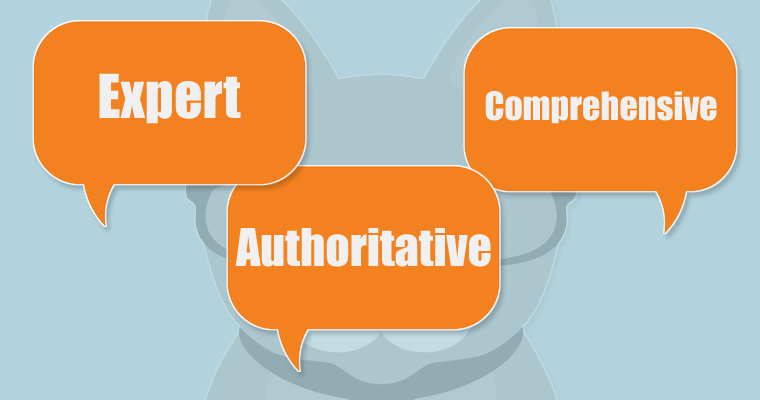 Should You Use Keyword Synonyms? Synonyms (and LSI) were initially used as a way to combat keyword spamming. Although Google was never a keyword-based search engine, it wasn’t entirely immune to keyword spamming (more formally known in scientific circles as Term Spamming). This kind of spam focuses on search query terms, which is why it’s referred to as search query Term Spamming. With the advent of the Hummingbird update and the increased ability for natural language processing (an attempt to understand language beyond keyword relevance), the search marketing industry responded by recommending the use of synonyms in order to rank better. The thinking goes that in order to be topically relevant for a phrase that you would have to salt your webpage with synonyms. But this strategy is a “back of the napkin” solution to a highly complex problem. The advice to use synonyms in a webpage is literally a joke: Did you hear the one about the SEO who walked into a bar, a speakeasy, a dive, a gin joint? Clearly, using synonyms is a simplistic approach to being topically relevant. It’s the tired old term spamming trick rooted solidly on ranking for keyword relevance, a strategy that no longer works. In my opinion, it’s not necessary if you’re focused on expertise, authority, and trustworthiness. Even way back in 2005, in the research paper cited above, it is stated that the goal was to present the most relevant and most important webpages. Words and phrases can have multiple user intents. The SERPs are ordered to satisfy the user intent of the most people. Thus if the user intent you choose to satisfy is less popular you will never rank at the top of Google’s search results. And that’s ok! There’s nothing you can do to change that situation when it happens. Not to get too technical, but other research and patents deal with using prior searches, location, and other factors to personalize the order of the sites that are shown in the results. However, that likely isn’t the norm across a wide range of search queries. At the beginning of this chapter, I stated that the best use of words is important. Understanding the user intent of a keyword phrase is paramount because it will guide the purpose of a page. The search quality guidelines state that every page is judged according to how it satisfies a site visitors goals. The quality guidelines state that the best pages “fully satisfy the user intent” of the search query. There is a ratings category called Fully Meets. It is applied to situations where the user intent is unambiguous. This applies especially so for ecommerce phrases where the intent to buy is clear. Fully Meets is the gold standard for satisfying a user query and becoming the number one ranked page for an unambiguous query. In my opinion, it should be your goal for satisfying the user intent even of ambiguous queries, where you identify all the possible user intents then choose which user intent you are going to satisfy. The query and user need must be specific, clear, and unambiguous. The result must be fully satisfying for mobile users, requiring minimal effort for users to immediately get or use what they are looking for. All or almost all users would be completely satisfied by the result—users issuing that query would not need additional results to fully satisfy the user intent. The top ranked sites rank in the top ten because their web pages satisfy the most popular user intent for that keyword phrase. Understanding the user intent of a phrase is important because it will guide your content creation strategy. In the case of an ambiguous user intent, where a keyword phrase has multiple meanings, it is important to make a list of all the different user intents. If you search on Google you may be able to discern the different user intents. The most popular variation is most likely to be the one that is highest ranked. For many search queries, the top ranked sites are not ranked at the top because they have more links pointing to their pages. Nor are they top-ranked because they contain all of the keywords. The top ranked sites rank in the top 10 because their webpages satisfy the most popular user intent for that keyword phrase. If there are three user intents for a search query, it is the most popular user intent that will be featured at the top – not the site with the most keyword anchor text. This literally gives the phrase Keyword Popularity a whole new meaning! If the user intent is split between more users who are researching for academic purposes and users who are researching to make a purchase, Google will rank webpages that are informational than transactional. No matter how many links you amass to your page, if the user intent of your page is unpopular then you will never crack the top five of any search engine. Ranking for keyword phrases is no longer about ranking the webpages with the most links and the most complete content. It’s about ranking the webpages that most fully satisfies the most popular user intent. The word paramount means that something is of extreme importance, more important than anything else. That’s why I used that word when I said that understanding the user intents of keyword phrases is paramount. This also relates to what was stated at the beginning of this guide, that keywords continue to be important, but in a different manner in which they have been used. Keywords are a window into what users want, the user intent. Google Trends is a good tool to identify changes in how keywords are being used. Google Trends will help you see how phrases are trending up, trending down, trending in a cyclical pattern and identify regional patterns. Understanding cyclical and regional patterns will better help you know when to roll out certain kinds of content and also to understand to focus your link building in certain regions for certain phrases, since those phrases will be more popular in those regions. This is an important insight! 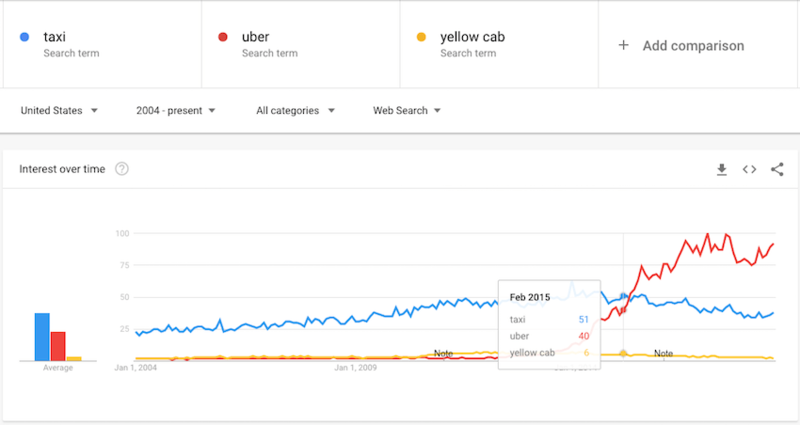 In the example above, it is abundantly clear that the phrase “uber” is wildly popular compared even to the generic phrase “taxi.” The trend line also shows that the phrase taxi is trending downward, in recent times the search inventory plummeted to as low as it was in 2004. Comparing keywords with brand names is highly useful. For example, the keyword trends for “digital cameras” trends downward with the introduction of the iPhone. This data can be used to confirm a hunch about a correlation in consumer spending habits. Another example is a comparison of the trends between the phrases “radio station” and the brand name “Spotify.” The phrase “radio station” is trending downward while the brand name “Spotify” is trending upward. There’s no correlation between the two trends, but it illustrates a change in how people are consuming music. 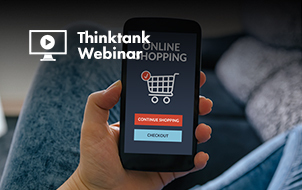 When you see a traffic decline even though your rankings are unchanged, it can sometimes mean there is a change in consumer behavior tied to the introduction of a new product or service. 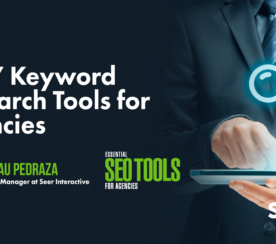 Compare keyword phrases with keywords whose actual search volumes you are familiar with – even if the known keyword phrase is unrelated. Consequently, it makes analyzing the search trends for an unfamiliar keyword phrase easier because you have a baseline for comparison. How can a webpage use a keyword phrase in a way that results in better rankings? A proper keyword strategy is predicated on creating a topical map of your niche in order to help you grow your site to become authoritative, expert, and trustworthy. Algorithms are tuned to satisfying user queries by answering questions. They are no longer merely matching search queries to keywords on a web page. This does not mean that you should phrase your pages as questions and answers. It means understanding the user intent/search intent latent in the keywords and constructing your content so that it satisfies the user/search intent implicit in the keyword phrase. Web pages rank because websites link to those pages. Websites link to those pages because those pages solved a problem, because it scratches an itch. People link to a site because of positive user experiences. View your keyword list through the framework of user intent/search intent and then consider how the resulting content can be used to create a positive user experience.